Product #20885 | SKU DCB307 | 0.0 (no ratings yet) Thanks for your rating! 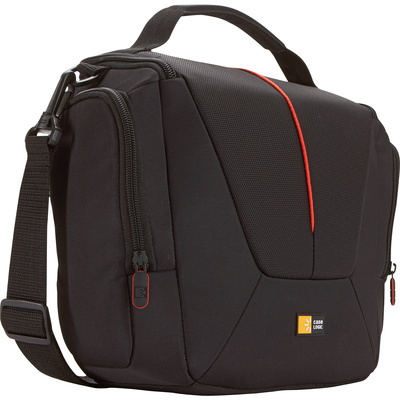 The Case Logic DCB-307 SLR Shoulder Bag (Black) is a polyester and nylon case designed to carry most SLR cameras, 2 extra lenses and multiple accessories. The case has a customisable internal divider system that protects the camera while it rests either vertically or horizontally inside the bag. There are side zippered pockets that store batteries, cables, chargers and filters, an internal zippered pocket that stores memory cards, a lens cloth and other slimline accessories and a back, slip pocket that stores a camera manual. The bag is carried by a grab handle or a detachable, adjustable shoulder strap.